Pulinkari is a tamarind based gravy made with coconut, tamarind and vegetables like pumpkin, ashgourd, ladies finger(okra), raw plantain etc. Podi podicha pulinkari is a Palakkad speciality and is a variation of the regular pulinkari. This pulinkari is made without coconut made using lightly sweet vegetables like pumpkin, jackfruit or ashgourd. 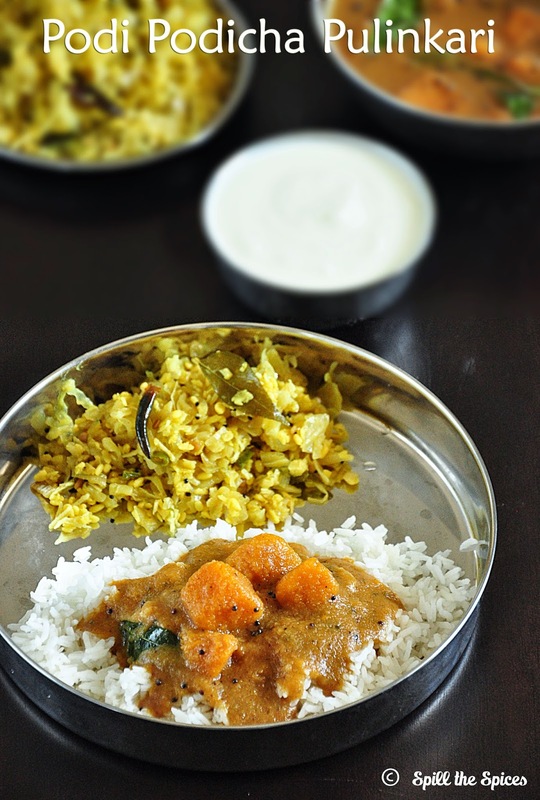 This pulinkari is an almost forgotten recipe and was shared my neighbor back in India. What's special about this dish is the freshly roasted and ground raw rice, chillies and fenugreek, which adds a unique taste. 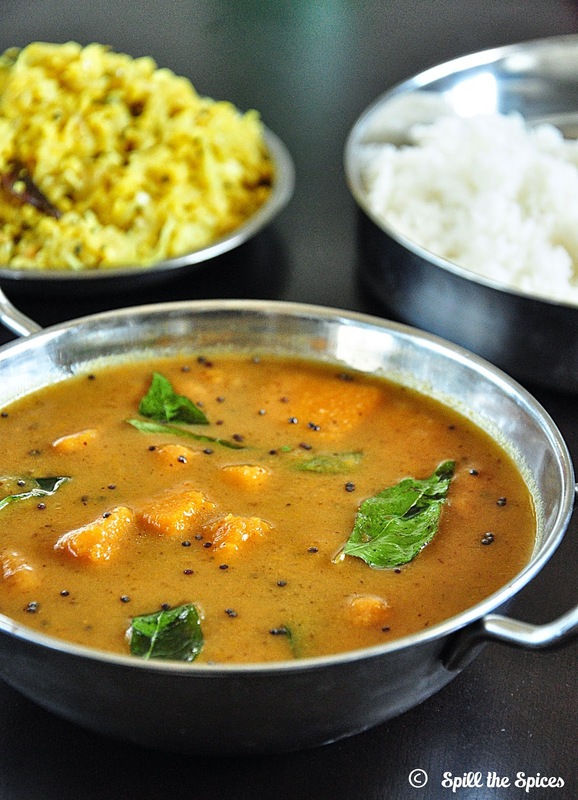 Since it has no coconut or lentils, it pairs well with rice and any thoran/poriyal or usili. It goes well with dosa and chapathi too. 1. Dry roast the raw rice. Once it starts to turn brown, add red chillies and fenugreek seeds. Roast till rice turns golden brown. Cool and grind to a fine powder. 2. Soak the tamarind in 1 cup warm water and extract the pulp. Add ½ cup water to the extract. 3. In a vessel add the pumpkin cubes, turmeric powder and ½ cup water. Cook the pumpkin uncovered until its half cooked. 4. Now add the tamarind extract and salt. Bring to boil and cook over medium flame until raw smell of tamarind goes. 5. Mix the ground powder with 1 cup water. 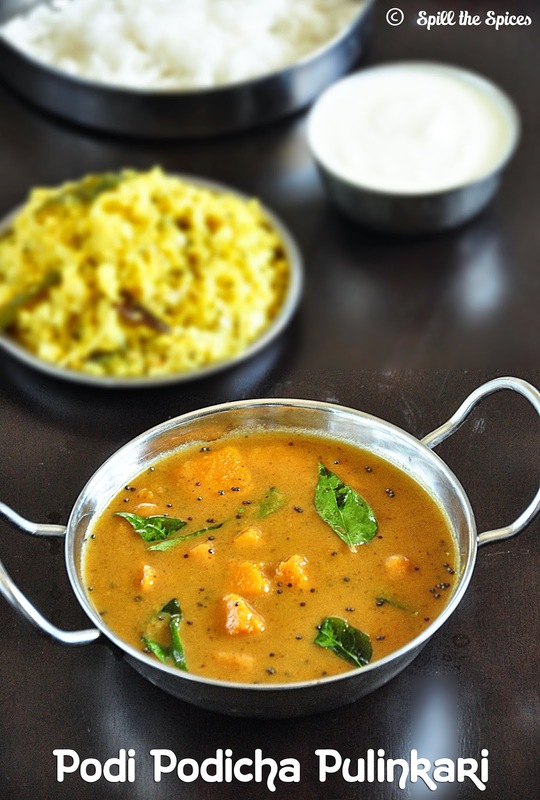 Add this along with jaggery to the gravy and cook for 5-8 minutes or until the gravy has slightly thickened. 6. In a small pan, heat oil and add mustard seeds. When it crackles add curry leaves and pour over the gravy. Serving Suggestion ~ Rice and thoran/poriyal/usili. The pulinkari thickens as it sits so add water accordingly. The consistency should be lightly thick. Adjust the amount of red chillies according to your spice preference. wow super tempting Cury. .yum!!! very different!! looks yumm!! a must try!! Tangy and delicious gravy, that plate looks very tempting..
what a tempting plate.. so yum! This curry sounds new to me.. Looks very appetizing.. Nice pics.. I m hearing this pulinkari for the first time. Looks delicious and tasty. love to try this sometime,looks very tempting and interesting flavors!! Delicious curry. I made something similar once. Goes very well with plain rice and appalams. This is a very new recipe for me. It looks amazing. This sounds new to me.. looks flavorful and delicious. Lip smacking gravy.. im drooling over it.. nice pics sona..
Have not heard about this curry. Looks so tempting.